The PARCC Assessment and Assistive Technology: What Do IEP Teams Need to Know? AT Success Story: Candido Can! BlueAssist is a global effort to create caring communities that are more responsive to individuals with cognitive and communication challenges. It takes the "safe routes to school" concept and combines it with the universality of the wheelchair icon to promote a new symbol for asking for help. Partnered with awareness and outreach efforts, the BlueAssist symbol helps individuals with intellectual, cognitive, and communication challenges to ask assistance from passers-by. In this way, BlueAssist may soon improve how community members look out for one another, and research suggests it may provide significant cost savings in the process. The BlueAssist concept was first launched as a graduate student's project in Belgium in 2007. It started as a symbol for use with low-tech communication aids--cards with different help messages--to assist users when out and about in their communities. BlueAssist is now a Belgium-based non profit, and its approach has expanded to include mobile apps with features useful for staying on task, safe, and connected to caregivers. An app version was tested with day programs and other institutions in Belgium and the Netherlands in 2010 and 2011, and was refined and tested on a larger scale with the support of the Belgian government in 2012 and 2013. Today, individuals with disabilities are trained with these low and high-tech BlueAssist tools to engage community members for assistance. In BlueAssist parlance, they are empowered by their expanding "interdependence." In the Netherlands and Belgium, the BlueAssist symbol is becoming integrated within public transportation and government services as well as other designated BlueAssist-friendly spaces (such as partnering businesses). Indeed, Belgium has officially recognized BlueAssist as a social innovation; as of 2013 the city of Ostend is encouraging the whole community to embrace BlueAssist, and Genk and Kortrijk will soon follow. Recently the BlueAssist Android app, and its companion apps (collectively referred to as "Cloudina"), were made available for use by anyone (not just institutions) in Google Play. In this way, BlueAssist is a top-down and bottom-up social movement driven, in part, by assistive technology. According to Sandy Hanebrink, Executive Director of Touch the Future Inc. (U.S. distributor of Cloudina), the BlueAssist app currently has over 2,000 users worldwide. Beyond Belgium and the Netherlands, BlueAssist is in Canada, the U.K., Spain, Germany, Israel, and Qatar. In the U.S., BlueAssist has initiatives in Georgia, North Carolina and South Carolina, New York, North Dakota and South Dakota and soon in Missouri, Florida, New Jersey, California, and Oregon. Shortly, she reports, BlueAssist is also coming to Portland, Maine. The University of New England is piloting Portland as a BlueAssist community to create BlueAssist-friendly spaces, and plans are underway to pilot the Cloudina apps with adults in a Portland day program. In the U.S., BlueAssist interest may also soon grow due to Senator Schumer's proposal for Avonte's Law. The law honors the memory of the 14-year-old boy from Queens, New York who went missing from school grounds last October (and was later found dead). Avonte Oquendo, like many children with autism, was prone to wander. If passed, Avonte's Law would finance optional electronic tracking devices to be worn by children with autism. "The tragedy has highlighted the need for both safer communities and a way for some parents to find their children before they get too far," Hanebrink notes. "Blue Assist can provide both." Indeed, the Cloudina Phone app (a companion app to BlueAssist) includes an optional, secure, GPS tracking feature. The option allows authorized contacts to find an app's user by sending them a text. It also enables a user to send his or her location (to authorized contacts only) with just the tap of a finger. The Cloudina apps are most commonly used with adults with intellectual challenges, such as Down syndrome and autism, but Hanebrink feels the potential reach is broader. The technology is appealing to job coaches, residential programs, adult day programs, and schools because it increases independence through community as well as remote caregiver support. "With the apps, users have learned to independently navigate public transportation. They are less reliant on special transportation services or on their coaches, which is a huge cost savings." Programs in Europe, she says, are reducing their waiting lists and serving more clients. "This movement benefits everyone. It's why it's taking off. We're creating safer more inclusive communities for individuals with disabilities, for students, for seniors. People are gaining independence and a better quality of life. Programs that support individuals are saving transportation dollars. It's win-win all around." The ability to create multiple help messages, each labeled by an identifying image or symbol (should the user not read). Synthetic voice options for reading messages aloud (speech generation). An integrated call button programmed to dial a designated support person. An interface with only two levels for ease of use. The app is available for a 30 day free trial and charges $12/month thereafter unless bundled with additional Cloudina apps ($16/month for the complete package). Cloudina Phone is a simple to use phone book app with unique features for users with cognitive challenges. Name or picture-labeled contacts, one per page, with call button. Swipe pages to browse contacts or view grid of contact options (if 8 or less). Secure GPS tracking. Allows the user to send their GPS location to a specific contact if lost. Designated contacts may also locate a user by sending a text message even if the user does not initiate communication. Each contact's hours of availability may be programmed into the app (preventing calls at midnight, for example). One level interface for ease of use. Displays the Blue Assist icon with one fixed "help" message (available in several languages). The ability to create and customize one additional message. 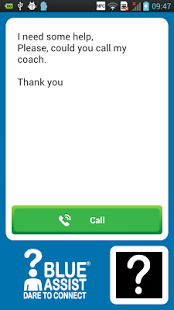 An integrated "call" button that is programmed so a community member can dial a designated support person for assistance. There are three symbols to choose from for use with the custom message to help the user identify the subject of their message if they do not read (a question symbol, a shopping cart symbol, and a bus symbol). Also explore the Cloudina Photo Album and Cloudina Calendar apps! These may be used for creating schedules, programming reminders, and accomplishing tasks. Last month, 85 people attended the second annual EdCamp Access Boston held at Marshall Simonds Middle School in Burlington. The participants included special and general educators as well as assistive technology specialists, occupational therapists, speech and language therapists, and students. They came from both public and private school settings motivated to learn from one another in the rapidly growing "unconference" tradition. EdCamp "unconferences" are free professional development (PD) events with no set agenda but a focus on education and, often, technology. They depend on the willingness of whoever shows up to participate and lead discussions on topics that interest them. EdCamps are not a way to earn continuing education credits; instead they're a grassroots approach to PD that take advantage of the participants' passion for learning from one another. They are democratic, non-commercial affairs without keynotes, vendor tables, or sponsored sessions. EdCamp Access focuses on technology solutions for students with special learning challenges (although not all session topics conform). The event was organized by Karen Janowski, an AT specialist working in Newton public schools (and long-time MassMATCH AT Advisory Committee member), and Patric Barbieri, Executive Director of LABBB Collaborative. 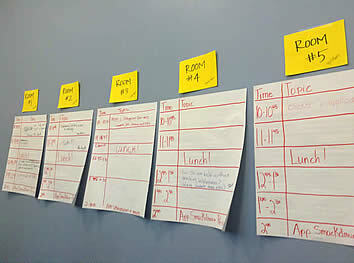 In the school's open central stairwell, they mounted a large paper schedule with blank time slots for break-out sessions corresponding with different rooms in the building. Markers were available for participants to offer sessions. Topics on this day emerged to include: "Let's Talk About Text-to-Speech," "Assistive Technology in the IEP," "Overcoming Limited Access to Technology," "Twitter 101," "MCAS and Struggling Learners," "How Do We Help Without Teaching Helplessness?" and "Clicker + Application." "We follow the rule of two feet," Janowski informed attendees during her opening remarks. "If you want to get up and check out another conversation, you are welcome to do so." At day's end, every EdCamp concludes with an "Apps Smackdown" in which all attendees gather to share apps that they admire. The most powerful moment of the day came right at the start. 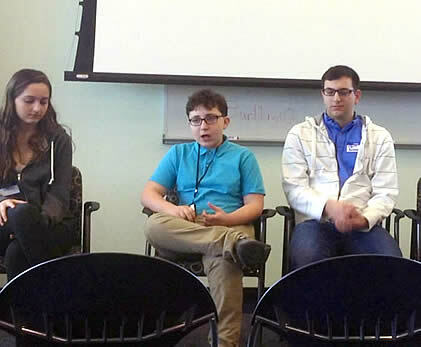 Janowski kicked off with a panel of five students who spoke of their own experiences and answered questions from the group as a whole. The students ranged from 5th graders to a 1st-year college student; most had learning disabilities and used assistive technology in the classroom. The panel was an opportunity for educators to listen to students report on what has helped and what has hurt. One 5th grade girl, "Sarah,"* explained how she uses Voice Dream Reader, the text-to-speech reading app, to hear books and follow along with highlighting text. She has dyslexia, and prior to obtaining an iPad, she might read one book in four months. With the app, she reports, she has read six books in a month. Another panelist, "Dan," an 8th grader, reflected on the challenge of using his apps in class, and the presumption that he isn't doing work. "Sometimes it would be helpful if teachers would trust students more, and not just assume we're goofing off." "So what do you think teachers need to know?" Janowski followed up. "This is an opportunity. This is a captive audience." Sarah: "That you are a normal person but you need technology." Dan: "Many teachers do not approve of it. But I think they should. It's a good feeling to turn your education around." The students moved between making app recommendations--Paperport Notes, myHomework, Notability--to how it feels to be seen as different, even bullied. As time ran out, Janowski encouraged them to continue the conversation by leading a break-out session, and many attendees followed two panelists to a classroom to hear more. Before concluding, however, one member of the audience spoke up to thank them. "You are pioneers!" she emphasized with conviction. The first EdCamp was held in Philadelphia in May of 2010. Since that time well over 200 events have been held and the movement is now international. The next general EdCamp in the Boston area is organized for May 3rd, 2014, but tickets were "sold out" (though free) within 6 hours of their availability. With 85 attendees in only its second year, EdCamp Access Boston will likely also grow rapidly. This year participants came mostly from within Massachusetts, but also from neighboring New England states. Mike Marotta, himself an EdCamp Access organizer, took the prize for traveling the furthest. "Karen Janowski came to our event," he explained, "so I figured I should come to hers!" He drove five hours with his daughter from New Jersey. "The day gave me a lot of ideas," reflected Glynis Cooney upon leaving the event. Cooney is a 6th grade language arts teacher from Amesbury who's been teaching for 8 years. "We don't have a lot of technology at my school. But listening to the students, in particular, showed clearly where we have to go next." Join the waiting list at the Boston EdCamp website. Learn more at the EdCamp wikispace. *Student names have been changed for this article. The PARCC Assessment and Assistive Technology--What Do IEP Teams Need to Know? Next year many Massachusetts students in grades 3-11 will take new computer-based state assessments based on the Common Core State Standards (CCSS). PARCC stands for Partnership for Assessment of Readiness for Colleges and Careers (PARCC); it is a consortium of 16 states, including Massachusetts, that is developing new assessments for the Common Core. While a paper-based option will be an available accommodation, for most students the tests will be digital and include new tools, access options, and possible accommodations. If your school district is adopting the PARCC assessment for 2014-15 (some districts will continue to offer the MCAS), it's important to get to know these digital tools ahead of time and help your students consider which works best for them. It is also important that IEP teams know how to insure their students have access to the tools, AT, and other accommodations they will need for the assessments. Parents should discuss with educators their child's strategies for using computers and consider how their child routinely completes homework and other tasks. The digital assessment is another reason it is important to make sure assistive technology is considered and documented in a student's IEP. PARCC is developing an assessment with built-in digital tools for use by all students as well as features which may be turned on or off based on individual needs. Students may also receive accommodations to use their own assistive technology if the need for it is documented in the IEP ahead of the scheduled assessment (and assessments may be administered at different intervals throughout the year). * "IEP or 504 plan teams may consider providing this accommodation to a student who has a print-related disability that severely limits or prevents his or her ability to access printed text by decoding, or who is blind and is unable to access braille to read text. This accommodation is not intended for students reading somewhat (i.e., moderately) below grade level." See pages 27-29 of the PARCC Accessibility Features and Accommodations Manual for guidance and more details. Student needs for accessibility features, tools, and AT become part of their PARCC Personal Needs Profile (PNP). The PNP is a collection of student information embedded into the technology platform of the assessment that is individualized for each student. Again, to use some tools, documentation in an IEP will be necessary. To help create a student's PNP, students should be exposed to PARCC's built-in accessibility features and have the opportunity to select and practice using them prior to test-taking time. For students with IEPs or 504 plans, it may also be important to determine if a built-in tool is adequate as compared with an AT tool they are accustomed to using. For some students the appropriate accommodation may be a paper and pencil version of the test. At the time of this writing, only sample test items are available to review, but sample tests with embedded supports are coming soon. There are many more accommodations possible for PARCC's assessment as well as advice and guidelines available for IEP and 504 plan teams. A good starting place is the PARCC Accessibility Features and Accommodations Manual (second edition). The assessments are currently undergoing field testing and the technology and policies will likely change based on that data and feedback. Keep up to date at the PARCC Website and at the Massachusetts Department of Elementary and Secondary Education PARCC Web page. Recently, Kristi Peak-Oliveira, Co-coordinator of the MassMATCH AT Regional Center (ATRC) in Boston, met with Candido Surita in his home in Dorchester. Candido needed help with communication, specifically with options for augmentative alternative communication (AAC). Originally from Puerto Rico, Candido understands both English and Spanish, but now has ALS (a progressive neurodegenerative disease) and no longer uses speech. Kristi was referred to him once he'd begun hospice care by his exiting speech language pathologist (SLP). His health insurance would no longer cover SLP services, yet more than ever he needed a way to clearly communicate with family and other caregivers. In addition to coordinating the AT Regional Center, Kristi works as an SLP for Easter Seals Massachusetts, the MassMATCH partner agency. For Kristi this is often a good marriage of roles and services. She can conduct an Easter Seals-funded AAC evaluation and demonstrate equipment from the ATRC short-term device loan program. Clients like Candido and family can borrow what they need to try for up to four weeks at a time. If they find equipment that works well for them, the ATRC will refer them to possible funding options from appropriate sources. Kristi, an augmentative communication specialist, is available for trouble-shooting along the way. Initially, Kristi admits, she was concerned there wouldn't be the technical support at home for a voice output system to be successful with Candido. 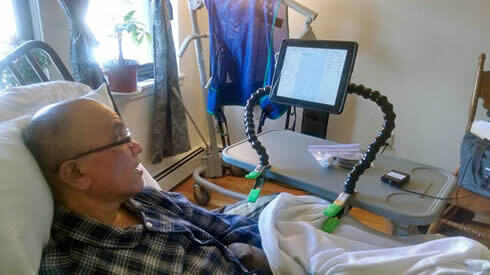 After all, Candido faces mounting physical challenges and using a speech generating device with a switch and, likely, automatic scanning would take problem-solving, family support, caregiver buy-in, stamina and patience. The home she was visiting was in a low-income neighborhood, and his primary caregiver--his sister--speaks only Spanish. The family had limited exposure to technology. Candido did not have a high level of education to start with and Kristi does not speak Spanish. Through Easter Seals MA and the AT Regional Center, however, Kristi has experience serving a wide range of clients. In addition to Spanish speakers, there are Haitians, Cape Verdeans, Chinese, and others. Outreach is conducted through the Multicultural Independent Living Center in Dorchester as well as health care providers that serve diverse populations such as Tufts Medical Center and Brockton Hospital. Over the years, Kristi says, she's learned the best approach for meeting new clients is to presume competence from everyone. "I think it's easy for people to make assumptions based on education, race, socioeconomic status," she reflects. "And I think the clients we work with must face that quite a bit in their lives. The last thing I want to do is make them feel that with me. So I assume competence, and try to be very, very respectful." Assuming competence with Candido would prove highly appropriate. To his home Kristi brought with her an iPad with the new app, Proloquo4Text. While most of Candido's family members do not have a lot of experience with iPads, she discovered his 13-year-old nephew (who was present for the evaluation) does, and that his sister and hospice workers were more than willing to learn. Man in bed gazing at iPad mounted to side table. Kristi decided that given Candido's intelligence, desire to communicate, and extremely supportive family, this set up could work well. Through the ATRC's short-term device loan program, Candido is now borrowing an iPad, iPad mount, a Bluetooth adapter, and the pillow switch. She has additionally recommended the equipment be purchased for him through the Massachusetts Rehabilitation Commission’s Independent Living Program. "The road ahead for Candido and his family is very hard," Kristi reflects, "but they clearly love and enjoy each other, and are working together to support Candido. The AT equipment is giving Candido a voice, and they are so appreciative. Families like Candido's help me love my work." * TECH UPDATE: Since this writing a tech glitch has emerged. iOS 7.1 interprets the Bluetooth switch adapter as a Bluetooth keyboard and, therefore, fails to bring up the onscreen keyboard. Candido is currently using his switch to select whole phrases and other non-keyboard options only. Apple does not provide a way to downgrade to a previous version of its operating system. Kristi is looking into the Pererro switch adapter (not a Bluetooth) as a possible solution. Proloquo4Text in Spanish... and Other App Options for Non-English AAC! There are a host of issues to consider when matching assistive technology to the needs, abilities, and preferences of an individual user. For augmentative and alternative communication (AAC) technology, hardware issues include touch screen sensitivity, switch compatibility, speaker volume, and portability. Software considerations include type-of-message creation (text-to-speech vs. symbols sets and recordings), options for displays and customization as well as the quality and variety of voices available for speech generation. Indeed it is inadequate to consider AAC software solutions based solely on the languages they support for speech and/or user interface. Yet without that functional cultural match, the other concerns may be irrelevant (particularly for literate users). Unfortunately we have a long way to go before there is a full menu of AAC technology offerings in languages other than English. Those looking to localize existing AAC solutions, such as David Banes of the Mada Center in Qatar (who speaks about this frequently), observe there are different challenges to retrofitting AAC software in more languages: symbol sets are culturally-specific, not all languages read left-to-right, high-quality synthetic voices can be unavailable or very expensive. Even still, progress is being made. Proloquo4Text is one example. This is Assistiveware's new text-to-speech app for iOS devices designed for individuals who do not speak, but who do spell and use text to create messages. In addition to English, its user interface is available in Spanish, French, Dutch, German, Italian, Swedish, Norwegian, and Danish. Natural-sounding (Acapela) voices are available in 15 languages (and include 95 voice options). Exciting for this continent is the U.S. version which offers the first-ever bilingual-American Spanish-English voices. Bilingual voices mean that individuals who use both English and Spanish can sound like the same person regardless of which language they deploy (there is an adult male voice as well as bilingual children's voices, both male and female). Proloquo4Text provides a customizable layout, word and sentence prediction (in all 15 languages since version 1.2! ), access to whole phrases, social media sharing, and specialty voices (such as "bad guy" for humor!) Assistiveware first released Proloquo4Text last November, and version 1.2 came out April 1st. The app costs $129.99 in the iTunes App Store. (Learn about the making of the first genuine children's voices for text-to-speech.) Assistiveware advertises multilingual support. Assistiveware is also currently working on a Spanish-language option for Proloquo2Go--its symbol-based AAC app--and has plans to provide other languages as well. Pictello, Assistiveware's visual story app, is available in Spanish, French, German, Dutch and Turkish. Learn more about Assistiveware's language options and plans. Touch Chat HD. A symbol and text-based full-featured AAC app that offers Spanish and Hebrew in addition to English. $149.99. iPad. Tap to Talk. A full-featured symbol and text-based AAC app that provides text-to-speech in Spanish, English, Italian, French, German, Arabic, Danish, Dutch, Finnish, Norwegian, Portuguese, Swedish and Turkish. The user interface is English, however. Available for most phones and tablets (and computers). $149.99 for the Designer app. Free for the Player app. Alexicom. Full-featured symbol and text-based AAC that is available for most devices in Spanish, English, French, German, and Italian. Free and paid versions. ClaroSpeak offers text-to-speech in Spanish, English, Arabic, Bokmål, Norwegian, Danish, Dutch, French, German, Italian, Polish, Portuguese, and Swedish. The US version of the app offers high-quality (Nuance) male and female US-Mexican adult voices. $.99. iPhone/iPad. Abilipad is a writing app that is also used for AAC. It provides Spanish, English, German, and French Acapela voices. $19.99. iPad. Personal Assistant Communicator uses images and text to communicate in Spanish, English and French. Customizable. Free for iPhone/iPod/iPad (requires iOS 7). Phrase Board is a text-based app designed by a registered nurse for patient communication. Available in Spanish, English, Arabic, French, German, Italian, and Swedish. Free for iPad. Keep in mind that beyond text-to-speech, many AAC apps rely on recording messages and creating labels (or use images and symbols). So while there are a limited number of AAC apps programmed for non-English language users, many are used in any language even if the user interface supports English-only. 18 Vision-related items, including a Braille Blazer, Braille and Speak, and other assistive tech for best offer in Boxford, MA. 3 Hearing-related items, including a Super Phone Ringer for free in Salem, NH. 24 Speech Communication-related items, including an AAC - Tango, barely used, for $400 in Portland, ME. 16 Learning, Cognitive, Development related items, including a classmate reader (for audio books) for free in Portland, ME. 263 Mobility, Seating, and Positioning related items, including 2 Acorn Stair Lifts for $3,000 in Monson, MA. 258 Daily Living related items, including a Respironics Cough Assist (non invasive mechanical insufflator-exsufflator) for $1,000 OBO in Medford, MA. 78 Environmental Adaptation related items, including a Invacare Reliant RPS350 Stand-Up Lift for Best Offer in East Montpelier, VT.
38 Transportation and Vehicle Modification related items, including a wheelchair mini-van for $8,000 OBO in Watertown, MA. 23 Computer-related items, including a free computer station that adjusts to any seating including a wheelchair in Watertown, MA. 4 Recreation, Sports, and Leisure related items, including an adaptive trike for $1,200 OBO in Concord, NH. Go to GetATStuff to search items by category or geography or to list what you need. Searching for a wheelchair? Scooter? Rollator? Or other gently-used durable medical equipment? Be sure to check out REquipment! Learn about additional AT reuse sites.